Since Rhinebeck I’m heard so many stories about this magical sock yarn. For some reason during Rhinebeck I completely missed their table and so was not able to purchase any at that time. I kept visiting their site, drooling over the colorways but couldn’t bring myself to actually order any. Until January 30th. I decided that I just had to have some and faxed them an order. Then I just couldn’t take it anymore and called them towards the end of February. I was told that the latest order of yarn had to be sent back because of a pilling problem but they were hoping to send out orders the next week. yay! I got the package last week! I managed to rip the box open and pull the skeins out and oh. my. God. They are SO soft and SO delicious. One skein of Scottish Highlands, Ruby Slippers and Lucy in the Sky. 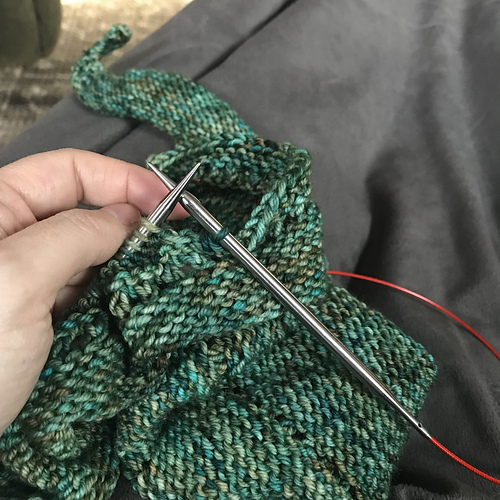 I am being a very, very good knitter and am waiting until I have my Bearfoot sox done before starting anything with these. What also helps to keep me focused is that I am at a freaking hotel tonight because I no longer have a working septic system at my house and all my other projects that I had in a lovely bag to bring along on this road trip are sitting on the coffee table in my stinky stinkin’ living room.